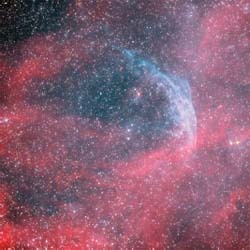 Named after Charles Wolf (1827–1918) and Georges-Antoine-Pons Rayet (1839–1906), who discovered the first example of this class of object, a Wolf-Rayet star is a high-mass star that is very young. It is pretty much a main sequence star, but it is so young that it has not reached a steady equilibrium; very strong stellar winds are gusting off the surface of the star, creating a wildly fluctuating, dynamic environment. WR134 is a Wolf-Rayet star, one of many young stars that have not yet reached equilibrium.